Skirball Cultural Center lends itself perfectly to a Modern Wedding Photography Album. 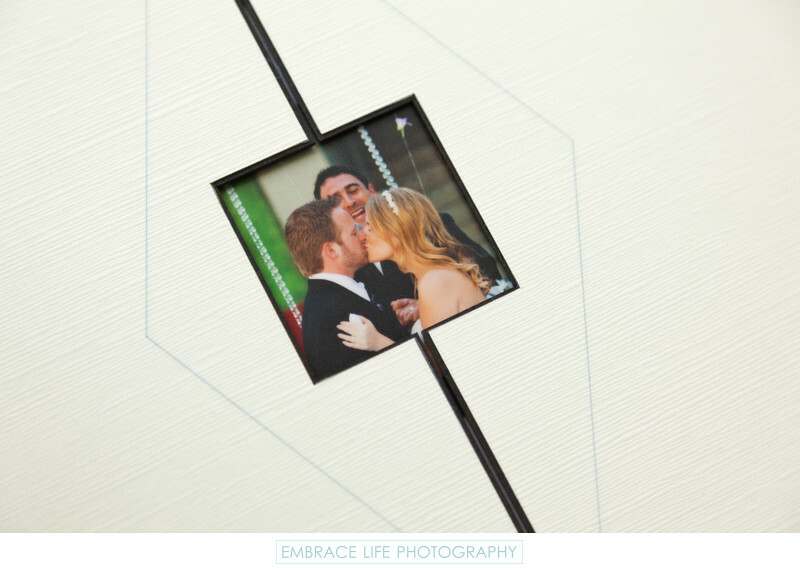 The window shown on this page opens start with a peek, but opens open to reveal the full photograph of the bride and groom's first kiss at the end of their Skirball Center wedding ceremony. Also seen here are a couple of tasteful design accent lines surrounding the cutout. This couple chose ivory pages as the background of their wedding photographs. White and black page backgrounds are also available. Location: 2701 N. Sepulveda Blvd, Los Angeles, CA 90049 .